Congratulations to Jenni and Joshua on Canada Day 150! July 1, 2017 Ottawa, Ontario, Canada | Today, Prime Minister Justin Trudeau named two new astronauts who will join Jeremy Hansen and David Saint-Jacques as part of Canada’s corps of space explorers. After a year-long evaluation, the Canadian Space Agency has selected Jenni Sidey and Joshua Kutryk from among 17 finalists and 3,772 applicants to be Canada’s newest astronauts. "Today, as we celebrate Canada’s 150th birthday, we also look towards an exciting future of space exploration. We are a society of creative thinkers, explorers, innovators. As we embark on Canada’s next 150 years and beyond, we can count on these two Canadians to help shape our future." 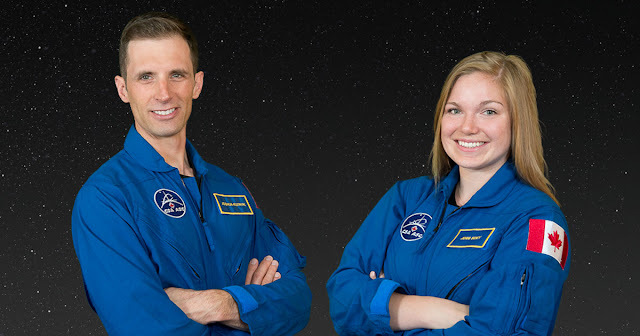 - Jenni Sidey and Joshua Kutryk become Canada’s 13th and 14th astronauts. Starting in August 2017, they will embark on two years of training at NASA’s Johnson Space Center. - Canada’s newest astronauts could eventually participate in missions to the International Space Station and other missions into deep space. They could also travel on commercial spacecraft. - Canada’s fourth astronaut recruitment campaign was launched in June 2016. The search attracted 3,772 applicants from a variety of backgrounds in science, technology, engineering and mathematics. - In Budget 2016, the Government of Canada invested $379M over eight years to extend Canada’s participation in the International Space Station until 2024. - In 2018, David Saint-Jacques will become the next Canadian astronaut to take part in a long-duration mission aboard the Space Station.